What could they possibly cook that you’d want to eat? There was a period of time in pop culture when, if you wanted to watch a professional chef cook something on television, you sat down in front of the TV and turned on daytime television. As an indoor kid, my preference was for local news channel’s cooking segment. Hosted by a bearded, avuncular man named either Mr. Food or Mr. Chef, it was what I now understand to be sponsored content for a regional grocery store — either Grand Union or IGA. I learned what beef Stroganoff was and how to make lasagna. As a child, I wasn’t making these dishes myself, preferring Kid Cuisines and handfuls of Goldfish chased with Kudos bars if left to my own devices, but I understood their appeal. Watching someone else cook something on television in real time is mesmerizing. It allows you to entertain the possibility that cooking is easy (it is) and fun. The Food Network bet the farm on that notion and won. BuzzFeed’s Tasty packages disembodied hands making cheesy potato skins into “snackable” videos that pop up in my Facebook feed and never seem to go away. Tell me that doesn’t look like Kristen Wiig. Recipe demonstrations have been a staple of morning television, but really hit their peak in the mid-nineties. You can still watch a celebrity chef or an actual celebrity cook tacos in front of a live studio audience now, but the medium found its way with familiar faces. There’s a “Good Morning America” cookbook and one featuring recipes from the “Today Show.” There’s also a cookbook published by my favorite daytime television pairing to date, Regis Philbin and Kathie Lee Gifford. Picturing Matt Lauer or Savannah Guthrie or Al Roker cooking something in their home is not a stretch; while Matt Lauer is very smarmy, I’m sure he can make a decent lasagna. Picturing Kathie Lee Gifford or Regis Philbin doing anything in the kitchen other than eating olives straight out of the jar after midnight is difficult. 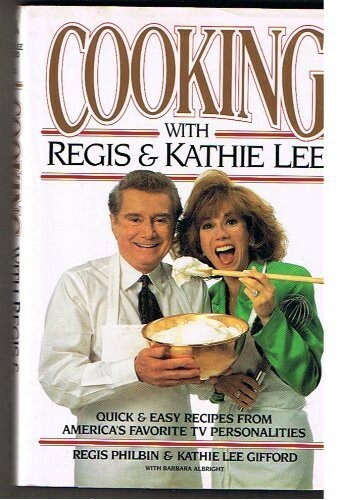 It is for this reason alone that their cookbook, “Cooking With Regis and Kathie Lee” inspired me. Picturing Kathie Lee Gifford or Regis Philbin doing anything in the kitchen other than eating olives straight out of the jar after midnight is difficult. The recipes featured in the cookbook are mostly recipes that were featured on the show—aimed at a very specific audience and absent any fancy ingredients or complicated techniques—by celebrity chefs and various other food-world luminaries. The occasional celebrity makes an appearance. Ismail Merchant (of Merchant Ivory fame) shared a recipe for yogurt chicken next to a Caribbean fried chicken recipe by Lola Yvonne Bell, a restaurateur who also starred in a music video, “Lola’s Caribbean-Fried Chicken.” Footage from the latter is nowhere to be found on the internet, but I imagine it was spectacular, as was the steel drum player that accompanied her and Regis, dressed in “island wear,” when she made the recipe on the show. Peeking into a cookbook from any time period is an easy way to take the temperature of that era. Any grocery store or bodega has soy sauce now, but it’s clear that in 1993, when this book was published, taste was slowly changing. Public televison staples like “Yan Can Cook” in the United States and Madhur Jaffrey’s “Indian Cookery with Madhur Jaffrey” introduced soy sauce and curries to a rarefied audience. Regis and Kathie Lee featuring curry and egg rolls on a show that was beamed into millions of households across the country doesn’t mean that they were stewards of diversity. But, I imagine that watching two affable people you eat breakfast with every morning from your kitchen table in Indiana make chicken curry and not die immediately afterwards helped, just a little bit. There’s a delightful section at the end of the book, “Family Favorites,” that purports to actually draw on recipes that Regis, Kathy and their long-suffering executive producer Micheal Gelman make at home. True to my prediction, there is only one recipe in there from Regis, “Joy’s Pasta With Chicken and Broccoli,” and technically it’s from his wife, Joy. I considered it briefly, but realized that I hate the way broccoli makes my house smell like farts and passed. Gelman’s Chicken Amore almost made the cut, if only for the introduction, which noted that the recipe was featured as the “grand finale of a week of bachelor cooking.” At the end of the segment, Gelman was “surprised by three women in bikins who covered him with kisses.” While pasta with chicken and canned mushrooms wouldn’t move me to seal the deal, I am tickled at the thought of Gelman slaving away over a hot oven for a woman he met in the personals section of the New York Review of Books. Kathie Lee’s recipes were more suited for big, family meals, or involved too much cooking for my taste. But, the nights have become cooler. The idea of turning on my oven for a prolonged period of time is no longer horrible, so I picked something that was easy enough to make and that I could pick at over the week: a jalapeño casserole, courtesy of Michael Gelman’s mother, Rhoda. Eggs are whisked with a can of evaporated milk and flour, then poured over a layer of canned green chiles, Monterey jack cheese and sliced tomatoes. There are no jalapeños in this jalapeño casserole, so I added some and made the first few bites of this dish almost inedibly spicy. Once baked, the dish puffed up nicely and lacked the gut-sagging heft of a quiche or a frittata. “That looks good,” my sister said as she passed it in the kitchen. Somehow, to my complete surprise, it was.